Though the Korg SP-280 is more portable than most other digital pianos, it doesn’t sacrifice sound quality or selection. The impressive range and variety of features it offers make it the perfect middle ground piano. Beginners can take advantage of the full, weighted hammer keyboard, and professionals have the option of enjoying the same three pedal functions that an acoustic piano provides. The SP-280’s sleek design looks flawless in the home or on the stage. The back of the piano blends function with style, making it unnecessary to hide it behind other instruments on stage or place it against a wall at home. Portability is key with the SP-280, it weighs in at less than 42 pounds, including the stand. 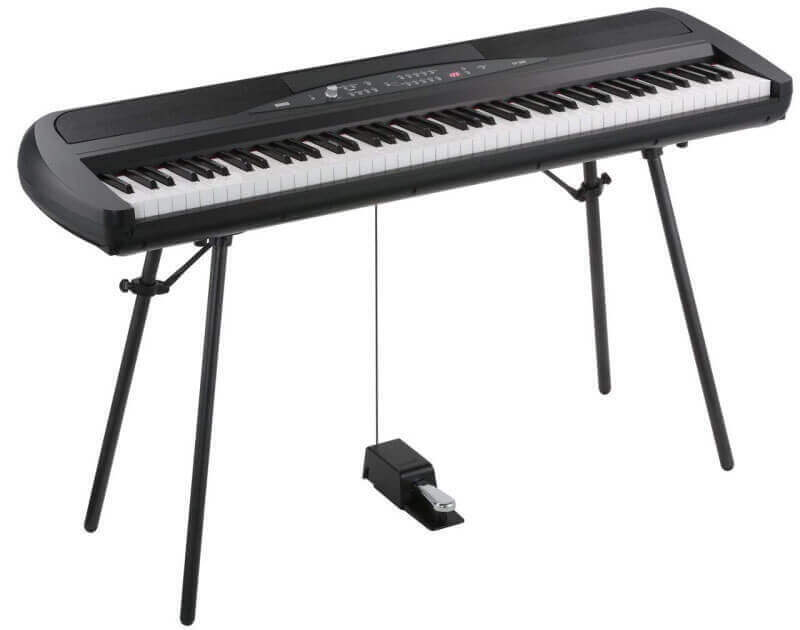 The newly designed stand takes up less room than other digital piano stands, leaving the area around the piano less cluttered, but it offers the sturdy support one expects from a Korg piano stand. Most mid-to-high end digital pianos use around 40W of electricity; however, the Korg SP-280 is more economical and efficient. It uses less than half the average amount of energy, coming in at an impressive 15W. Because power consumption is so low, musicians can practice that extra hour or two without having to worry about the cost of powering the SP-280. Because of the Natural Weighted Hammer Action keys, the Korg SP-280 offers a playing experience similar to an acoustic piano. The lower register of the SP-280 has the heaviest action, and the response lightens in the upper registers. Using the Key Touch Control function, pianists have the option of adjusting the level of output for their playing touch, giving them greater control over the piano’s audio dynamics. The SP-280 comes with a damper pedal that essentially functions as a half-damper pedal, giving players the freedom to control the damper effect by changing the amount of pressure they place on the pedal. There is also an optional pedal unit for the piano, and when it’s connected, musicians can use the soft and sostenuto pedals alongside the standard damper pedal. The speakers on the SP-280 are an impressive 22 watts each, making them rather substantial sound producers. Though players have the option of connecting to amplifiers via MIDI connectivity, the SP-280’s standard speakers should be adequate for playing in quiet to moderately noisy environments. The SP-280’s built in metronome is a great tool for beginners. Musicians have the option of adjusting the time signature, tempo, and volume. Additionally, the metronome also has an accent feature, which uses a bell sound to alert the player to the accent. The Line In jack allows players to connect an audio player device to the SP-280 and listen to it through the piano’s speakers. This enables musicians to play along with a selected track and provides an easy setup for most live performances. Another option available on the SP-280 is connecting speakers or a recording device to the digital piano through the Line Out jack. Finally, the SP-280 also supports MIDI (In and Out). With MIDI capability pianists can easily transfer performance data from the digital piano to their computers. Furthermore, MIDI connectivity lets the devices that are connected through it control each other. Though not as light as other portable digital pianos, the Korg SP-280 requires less ground space, thanks to its streamlined stand and sleek design. Its 88 Natural Weighted Hammer Action keys reproduce the feel of playing an acoustic piano better than many other digital pianos in the under 1000 dollar price range, and the optional pedal unit feature provides pianists with three pedals, just like an acoustic piano. These two features make the SP-280 a great choice for serious students or performers familiar with the nuances of acoustic pianos. From an artistic perspective, the SP-280 has much to offer. The large range of sounds and the impressive number of songs provide musicians with almost endless variations in style, tone, and voice. The ability to connect multiple different devices to the digital piano enables players to take their music and performance skills to the next level. However, the SP-280 lacks a built-in recording system, forcing musicians to use a second device to record songs and ideas. The Korg SP-280 is a great, energy efficient option for a professional or a beginner. Its features offer professionals all the comforts of an acoustic piano, and its versatility provides beginners with numerous opportunities to sharpen their skills. The Korg SP-280 is a good quality digital piano and a great option for professionals and beginners, though professionals will appreciate the piano’s features more. The variety of sounds and features the SP-280 offers makes it a versatile, portable digital piano. Despite the fact that the SP-280 lacks USB connectivity, the MIDI connectivity should be suitable for most musicians. However, if USB connectivity is an issue, pianists have the option of using a MIDI to USB converter. Overall, the SP-280 is a great digital piano for the price; its versatility makes it an invaluable addition to any musician’s collection.